This artist's conception of our galaxy shows where Earth is located relative to the object astronomers have just measured. These findings will allow even better depictions of the Milky Way in the future. Astronomers have directly measured a blazing-bright object on the opposite side of the Milky Way, almost doubling the record for the most distant object measured in our own galaxy. The researchers used a system of 10 radio telescopes in New Mexico called the Very Long Baseline Array (VLBA) to pinpoint the distance to the glowing, star-forming region. The answer has to do with location. Our solar system is positioned about halfway out on one of the galaxy's massive spiral arms, so the only view we get of the Milky Way is side-on. It's like trying to map a forest you're standing in by measuring the distances between the trees around you. Except, you can't walk around in these "woods," because the Earth isn't moving fast enough to give Earthlings much of a different perspective on a human timescale. This is why the constellations look the same today as they did thousands of years ago. Dust, gas and stars in the galactic disk obscure our view of objects farther away, just as the trees obscure a person's view in the analogy, researchers said in a statementabout the new study from the National Radio Astronomy Observatory (NRAO). But we can twist and turn to get a better look at the woods around us and see how the features appear to move as we change our perspective, the researchers said. This phenomenon, called parallax, is what makes your finger seem to jump when you hold it in front of your nose and alternate which eye you use to look at it. Most distances in astronomy are extrapolated from data about the brightness of different objects, said Tom Dame, a researcher at the Harvard-Smithsonian Center for Astrophysics in Massachusetts and co-author on the new work. And often, scientists have to use one distance to calibrate for that of an object located farther out, and repeat that process multiple times. But using parallax cuts out that reliance on knowledge about other objects. "The thing about parallax is it's just beautifully direct. It's just based on trigonometry," Dame told Space.com. Dame's group used that technique to measure the distance to a star-forming region called G007.47+00.05 on the opposite side of the Milky Way. Researchers used the VLBA to measure the region's apparent shift in the sky when viewed from opposite points in Earth's orbit around the sun. The resultant jump was roughly the angle that a baseball on the moon would take up in your field of vision, as viewed from Earth, according to the statement. This corresponds to a distance of more than 66,500 light-years. The previous record for a parallax measurement stood at about 36,000 light-years, researchers said in the statement. "Most of the stars and gas in our galaxy are within this newly measured distance from the sun," Alberto Sanna, the study's lead author and a researcher at the Max Planck Institute for Radio Astronomy in Germany, said in the statement. "With the VLBA, we now have the capability to measure enough distances to accurately trace the galaxy's spiral arms and learn their true shapes." The slight angle between our view of region G007.47+00.05 in spring and fall allowed scientists to calculate the region's distance from us. G007.47+00.05 is a powerful source of microwaves, which pass through dust and gas relatively undiminished, Dame said. The region's incredible brightness confused scientists until they determined that molecules in the region resonate with and amplify the light of a young, massive star located nearby. The system functions like a microwave laser, called a maser. In this case, "we happen to be right along the beam," said Dame. 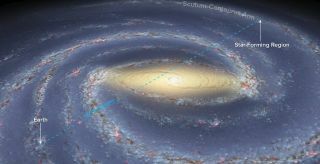 The measurement was part of a larger, five-year project called the Bar and Spiral Structure Legacy Survey (BeSSeL), which aims to map the far side of the Milky Way using parallax measurements of these maser sources, said Dame. This measurement came in the last year of the survey, when the team spent more time on a few objects of particular interest, Dame said. The BeSSeL survey measured about 200 maser sources in total. "Within the next 10 years, we should have a fairly complete picture," Mark Reid, who heads the BeSSeL team from the Harvard-Smithsonian Center for Astrophysics, said in the NRAO statement. The new work was detailed today (Oct. 12) in the journal Science.